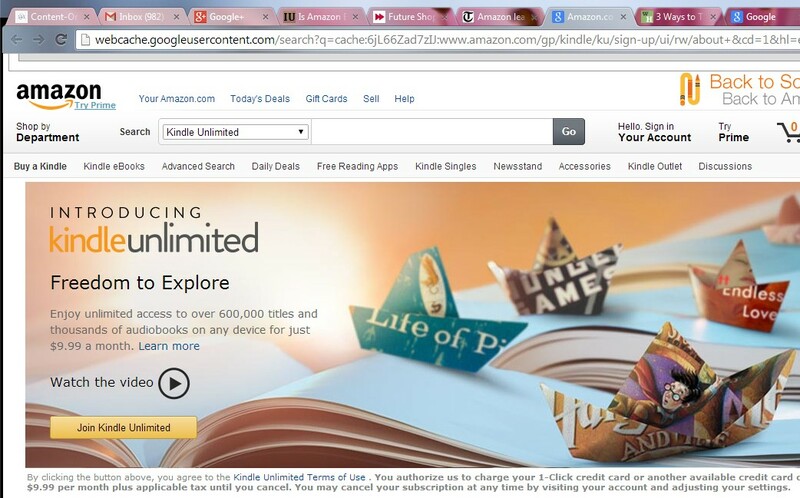 Amazon is offering an e-book rental service: “Kindle Unlimited”. The “all-you-can-read” book service will cost $9.99 per month. Amazon’s big advantage here: they are offering nearly 8,000 titles in Audio-book format and over 600,000 book titles. The current Kindle Owner’s Lending Library has a one-book-per-month cap, so this could be an option for Prime users who want more access. Amazon certainly enters a crowded field and will have to compete with Scribd and Oyster. Scribd, which launched a book subscription service last October, charges $8.99 for access to best-sellers, classic books and new releases from bigger trade publishers. They have 80 million users and offer works from 900 publishers. They allow users to contribute works. Oyster boasts access for $9.95 to more than 500,000 books, but the majority of those titles come from self-publishing service companies, such as Smashwords. How Much will Authors Receive? Amazon’s official announcement for writers/publishers: “KDP authors and publishers who enroll their books with U.S. rights in KDP Select are automatically enrolled in Kindle Unlimited. Inclusion in Kindle Unlimited can help drive discovery of your book, and when your book is accessed and read past 10% you will earn a share of the KDP Select global fund. For the month of July we have added $800,000 to the KDP Select global fund bringing the total to $2 million. Reach more readers – With each 90-day enrollment period, your book will appear in Kindle Unlimited in the U.S. and the Kindle Owners’ Lending Library (KOLL) in the U.S, U.K., Germany, France, and Japan which can help readers discover your book. Earn more money – When your book is selected and read past 10% from Kindle Unlimited or borrowed from KOLL, you’ll earn your share of the monthly KDP Select Global Fund. You can also earn a 70% royalty for sales to customers in Japan, Brazil, India, and Mexico. Maximize your sales potential – Choose from two promotional tools including: Kindle Countdown Deals, time-bound promotional discounts for your book, available on Amazon.com and Amazon.co.uk, while earning royalties; or Free Book Promotion, where readers can get your book free for a limited time. Author-publishers have an advantage: Amazon doesn’t have any books from the so-called “Big Five” publishers: Penguin Random House, Simon & Schuster, HarperCollins, Macmillan, and Hatchette. Some of these big houses have agreements with Oyster, as well as Scribd, and are likely not cooperating with Amazon’s new service. Read also Joe Wikerts‘ commenting blog post on this. Amazon seems to become the 21st century’s digital library. “Kindle Unlimited” could completely change the market. Why purchase individual e-Books or bulky physical copies when you can read hundreds of thousands of books for just $9.99? So it seems that KindleUnlimited is worthwhile for lower priced books, while higher priced are better of without. Please check out all previous posts of this blog (there are more than 1,140 of them : ) if you haven’t already. Why not sign up to receive them regularly by email? Just click on “Follow” in the upper line on each page – and then on “LIKE” next to it. There is also the “SHARE” button underneath each article where you can submit the article to Pinterest, Google+, Twitter, Facebook, Tumblr and StumpleUpon.